Garages used to be just a place to park your car and store some tools. But times have changed and people are relying on the garage to be much more. Nowadays most people find it an excellent storage facility however it’s not always well organised. We now require storage for not only tools and garden equipment and cars but also bike storage, camping gear, Christmas lights, winter clothes, outdoor furniture and many other bits and bobs. Some people have so many things that garages become a dumping ground. 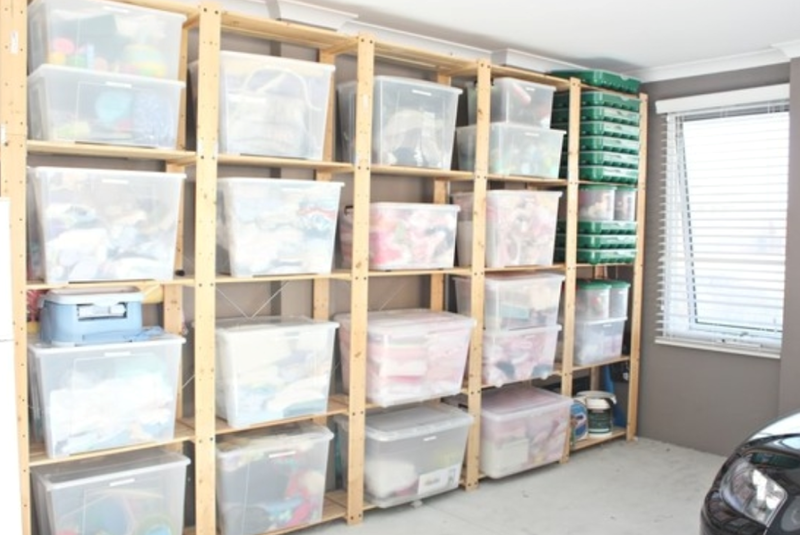 So to avoids this becoming you, here are some great DIY garage storage solutions. Some people struggle to find the right shelving unit to fit their storage needs and others have more things than their garage can hold. 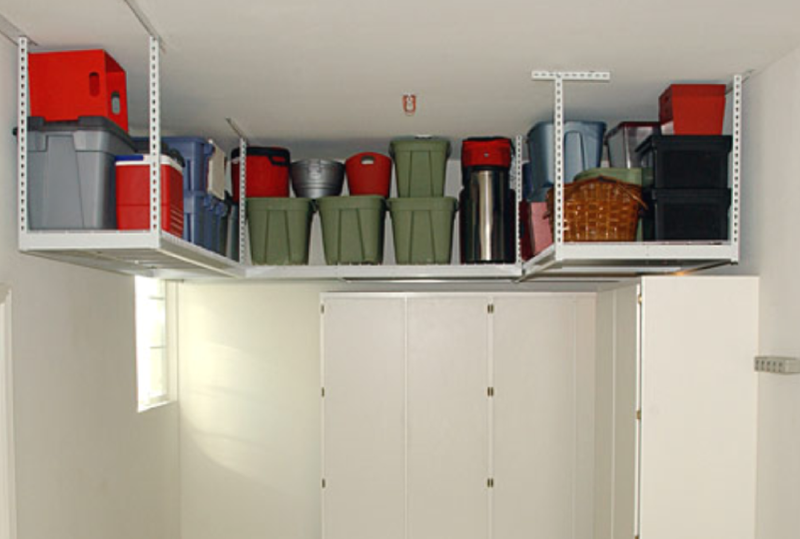 This is where overhead storage racks come in handy and are ideal for storing things up high, using the space which is generally left empty. These ceiling/overhead racks take up no floor space and provide a great solution to storing bulky items you only need once a year. 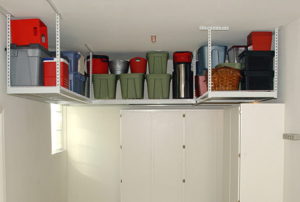 Overhead storage racks come in all shapes and sizes so you need to carefully plan installation. You need to consider what space you have available what you are planning to store on them and the weight of the objects as well as what material or system you need. When fixing overhead racks to ceilings and walls check with a professional or the supplier if it’s safe. 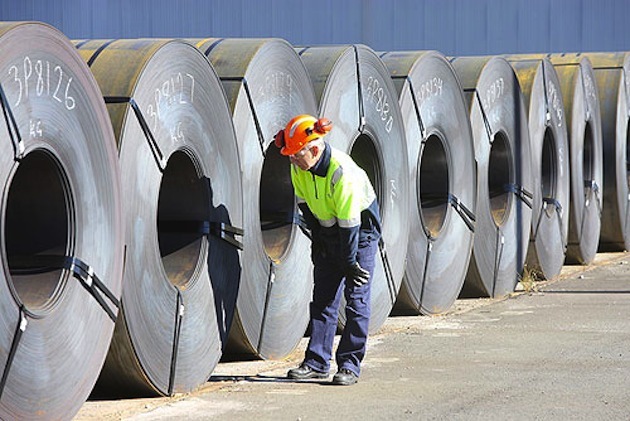 Make sure the system or materials you use can safely hold the weight you wish to store on them. When planning your racks keep your car height, walking area and safety in mind. There are many online retailers and hardware stores that can provide you with systems to create overhead storage. It would be best to ask professionals for assistance unless you have previous experience in this type of DIY project. 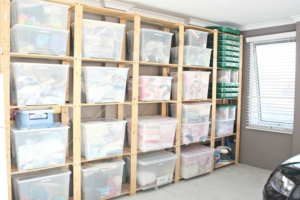 In many garages which have not been properly planned, you can walk in through the door and see many boxes and cases or ‘stuff” scattered on the floor and along the walls. This is a poor use of space and can be easily straightened out with a sturdy utility shelf and a practical storing system. Utility shelves made from a strong frame of either wood or steel are great for garages and if coupled with cardboard or plastic storage boxes you can organise and tidy up all your things onto the shelves. Clearly label your boxes on both ends so you can easily find exactly what you are after each time. This neat and practical storage solution will leave you surprised with time much time you can save when searching through the previous mess. Make sure you measure and plan your shelves before either buying or building them. Make sure they are wide and deep enough to efficiently meet your storage needs. Don’t forget to also check which storage containers you wish to use to get the maximum use out of your utility shelf. There is nothing more frustrating than having to rummage around a messy tool box or cupboard looking for those teeny tiny bits and bobs you need for a home repair or a handyman project. You know those little things… the screws, connector’s, nails and pegs. We found two great tips to keep these little things under wraps. The Family Handyman shared this great idea, which calls for a piece of plywood and resealable plastic sandwich packets. 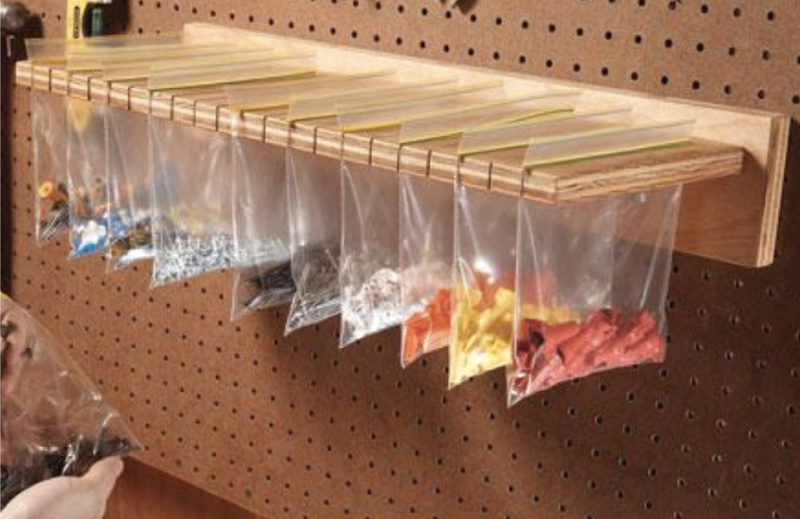 By sawing some neat slots into the plywood and fixing it to the wall like a shelf, you can slide in the sandwich bags (int0 the slots), so your nails and crews are hanging neatly in a row. It not only helps save space and keep your things tidy but it allows you to cut time rummaging around for what you need. Another cool idea is using old glass jars and fixing the lids to the bottom of a sturdy shelf. How this works is you take the empty jar lid and use screws to fix them to the bottom of a shelf, you can put as many jars as you want up as long as the shelf can hold them securely and you can still easily access each individual jar. All you have to do then is to sort your nails and things into individual jars and when you are not using them, screw them back to the bottom of the shelf by their attached lids. Again this is a great way to store and access those small essentials. Make sure you don’t weigh down the shelf as the weight can eventually loosen the brackets or fixtures. Ensure that each time you put the jars back that you have securely tightened them. Here is an idea which utilises a space not many people think to use in their workshops or garages… the backdoor! Why not fix some storage racks; hooks and magnets to the back of the door to help tidy up your tools and garden gear. You can add baskets to hold more than a few things or some PVC piping to hang your brooms from. If your door has an uneven surface like brackets, or you are worried it’s not sturdy enough why not screw a large piece of plywood to the brackets or directly to the door to add a sturdy flat surface? And if you have a hollow door you can use construction adhesive/Liquid nails to secure it. Measure the correct size for the plywood. You don’t want it to obstruct the hinges or the door from closing. Pegboards would also work great but be aware of its weight, what your door can hold and the space between the wall and the door before using one of these.